I grew up in Charlotte as a Yankee fan, as there were no Southern baseball teams at that time. I listened to Mantle and Maris on the radio. 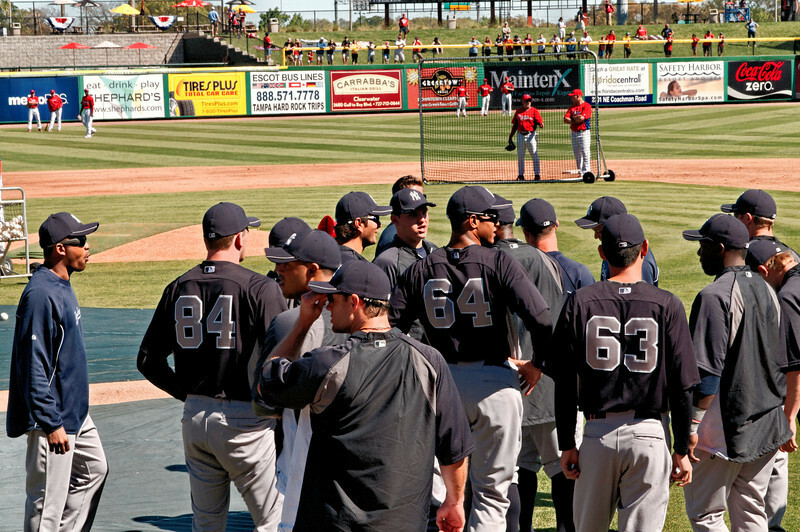 I have been to old Yankee Stadium and seen the Yankees play the Red Sox at Fenway, but at the top of my bucket list was to see the Yankees in spring training. So Joyce and I, along with our friends the Olneys, went to Florida to see the Yankees play the Phillies and the Braves during the first week of March this year. The Phillies' stadium is in Clearwater and the Yankees' stadium is in Tampa. There are 40 players on the Yankee roster at the beginning of spring training, which the team must reduce to 25 by the end of the month. The games are great fun for fans as you can get close to the players, but for the players, this is serious business. For those without contracts, this may be the last time or the only time they get a change to make it to the "Big Show." I tried to take a series of pictures here that capture some of the color and action of spring training games. Between the two games, we also attended horse races at Tampa Bay Downs. I had never been to a real horse race, outside of steeplechases in Southern Pines. There were 10 races that day, and I tried to capture the color and action here also. Hope you enjoy this brief visit to sunny Florida.